Just recently we have been helping Wras with a few call outs for deer fawns, our first-Dylan the roe deer fawn as you know didnt make it but in the last 2 weeks, we have had 5 fallow deer fawns come in via WRAS for care with Chris and Sylvia. 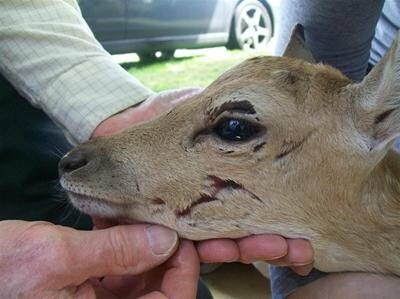 3 of the 5 fawns were caught up in fencing and have bad ligature wounds, another other was attacked by a dog and has nasty bite wounds on the inside of his hind leg, and one was a hit by a car. All have had to have regular veterinary treatment, we do as much as we can ourselves but wounds like some of these do need an expert eye every so often, to make sure they are going in the right direction. We have never had so many fawns in one go, as you can imagine it is very expensive, not only with the medication and veterinary treatment but they all have to be fed. At this age 3-5 weeks they still need milk, raw goats milk, and that doesnt come cheap. When you have 5 drinking 3-4 pints per day,at £1.85/pint in all adds up. So WRAS has set up a DEER RESCUE FUND, to try and raise money not only for the care of these 5 but also to build an onsite facility where we can have our own veterinary clinic and operating theatre. June and July can be busy for fallow fawns, but they also have late babies in September/ October, so we are preparing ourselves for what maybe to come. There is no facility in the South East to care for these casualties, and as we have the experience we thought it would be a good idea to put it to good use and set up a clinic with all the facilities needed on site. Less stress for the animal as there are no car journeys once on site. We have the land, the vets,15+years of rearing deer, we just need the building and equipment. If anyone out there is able to run a fund raiser for us or even just donate to the fund, you can do this, by text on 70070 with the words Deer88 £(amount), by cheque or our bank details are on the website. Please help us to help the deer.